Electric cookers are one of my favorite kitchen innovations. They make meals easy and tasty, and also allow you to make pretty large batches of your favorite dishes at a time. They don’t require constant attention or engagement, and you get a huge variety of delicious meals with this kitchen tool. The best electric cooker for elderly people will have some added safety and ease of use features, as compared to a standard kitchen’s electric cooker. Below are some of my all-time favorite electric cookers for older people to use in their kitchens, along with some important features and specs to look out for! Along those lines, other easy to use features like big buttons, an easy to read display, and ergonomic lids and handles are also incredibly important for seniors with arthritic hands who are looking for a pressure cooker. All of these will make the experience with the product much more enjoyable, and tailored to an elderly chef who may have some limitations in terms of eyesight and hand motion. Finally, for any electric cooker, make sure it’s sufficiently versatile for your cooking needs. It should be able to handle all kinds of dishes, from breakfast to lunch to dinner. Various heat and cooking settings will help with this, so just make sure your electric cooker has this level of versatility to add the most value to your kitchen. Finally, for seniors especially, it’s important that the cooker is easy to clean, whether it can be thrown in the dishwasher (which underscores the lightweight aspect as well) or cleaned with as minimal effort as possible, this will help seniors in the kitchen looking to save time and energy. With all of that in mind, let’s take a look at some of my favorite electric cookers for seniors. This electric pot cooker checks off most of my boxes. It has a large 10 inch grill and a 3 or 4 quart pot to cook all kinds of meals. The raised grill surface allows fat to drip away, leaving you with a healthy meal, but you can also use its slow cooking, steaming, and simmering functions to make other dishes as well. It’s stylish enough that it can double as a serving dish, and its nonelectric parts are dishwasher safe for easy cleanup. The pot itself is actually nonstick and has a built in pouring spout, so food will glide right out. In terms of easy to use features, the adjustable temperature dial is large and completely controllable, and the cooking pot also has cool to the touch housing so you won’t have to worry about burns. 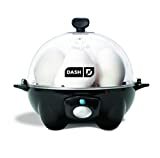 Next, for a great breakfast-oriented electric cooker, this egg cooker makes hard boiled eggs, soft boiled eggs, poached or scrambled eggs, or even omelets. Best of all, it’s lightweight (only about a pound) and compact, so it can fit into even the tightest of counter space. All of the accessories (a poaching tray, omelet tray, 6 egg holder tray, measuring cup, and recipe book) fit inside the device as well, which is a nice extra space saver. It’s a very simple machine, so seniors will appreciate the easy-to-use functions. It even has an auto shut off feature to prevent overcooking, so the eggs are ready when you are. While I’d like a little more versatility in terms of the kinds of dishes this one can produce, it’s a great little tool if you’re an egg fan. This electric pressure cooker puts instant pots in their places. It’s much easier to use than its more expensive counterparts with push button controls, easy to read digital display, thermostat and a built in timer. It has a huge range of settings, from cooking to browning to simmering to sauteing to warming. The large capacity (6 quarts) is big enough to feed a family with about 70% less cooking time. The cool touch handles make it easy to serve right out of the pot as well, and it’s nonstick surface makes cleaning easy. The nonelectric pot is also dishwasher safe! This is one of my favorites on the list. Next, the Presto electric cooker is also very versatile, and its primary advantage is the tempered glass cover, which allows you to check on your food as its cooking. 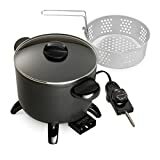 You can use it to make pretty much anything, including soups and casseroles, steamed vegetables and rice, pasta, roast beef, and even deep fried foods with an included steam/fry basket included. It’s also dishwasher safe, which is a big plus. It’s fairly large as well, so it could definitely serve a family dinner one night. 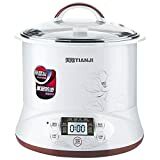 Finally, this high end model of an electric cooker is worth the investment if you use an electric cooker for almost anything and want the very best. It has guaranteed mild and even heating due to the ceramic pots, and also has the capacity to cook 3 dishes at a time with 3 ceramic bowls inside, or just one big dish in the stainless steel body. The versatility here is unmatched. It also has an easy to read digital LED display with the preset menus, settings and functions which is fairly self-explanatory. Slow cookers are invaluable kitchen tools for people with busy schedules, and especially seniors. They make cooking simple and easy, and there are so many varieties to choose from that you’ll be able to use one for almost every meal of the day. Make sure your slow cooker is lightweight, versatile, easy to clean, and has easy-to-use functions. For other kitchen appliance ideas for seniors, check out my microwave oven buying guide and guide to simple coffee pots too! Do you have other cookers you recommend for seniors? Also, if you found this guide helpful, share on your social media and leave a comment below!